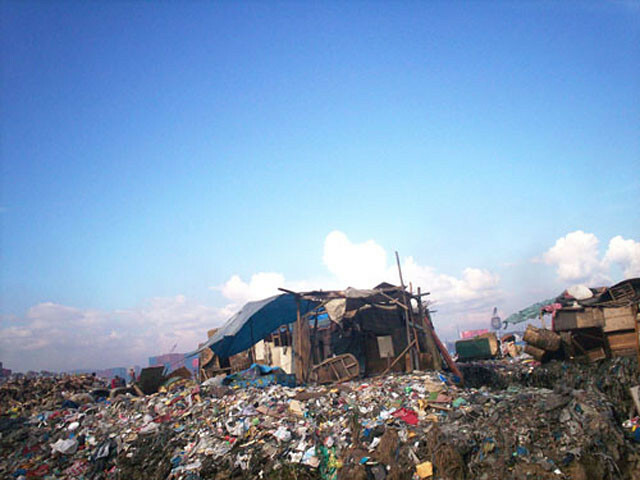 Thousands of tonnes of garbage are dumped on the towns surrounding Manila each year. Photo by Stefan Christoff. A grassroots political poster hangs above a Payatas home. Photo by Stefan Christoff. 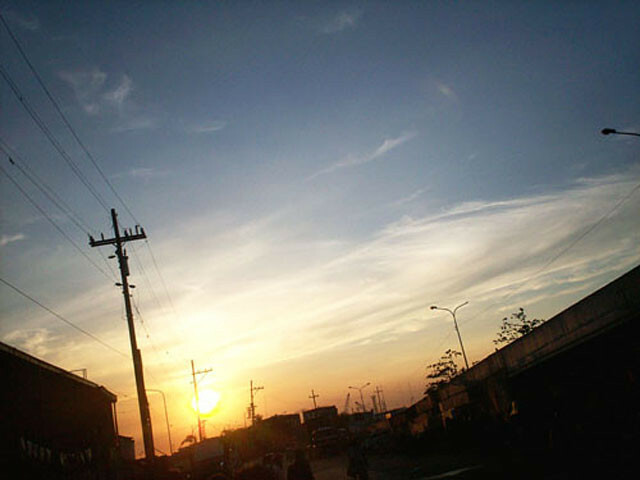 A new day dawns with new leadership, but will it be enough to change the lives of the millions living in poverty. Photo by Stefan Christoff. 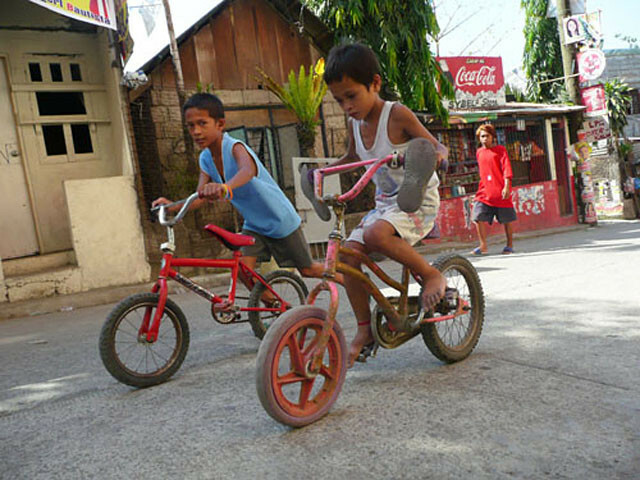 Children cycle through Payatas, one of the Philippines’ most impoverished communities. Photo by Stefan Christoff. 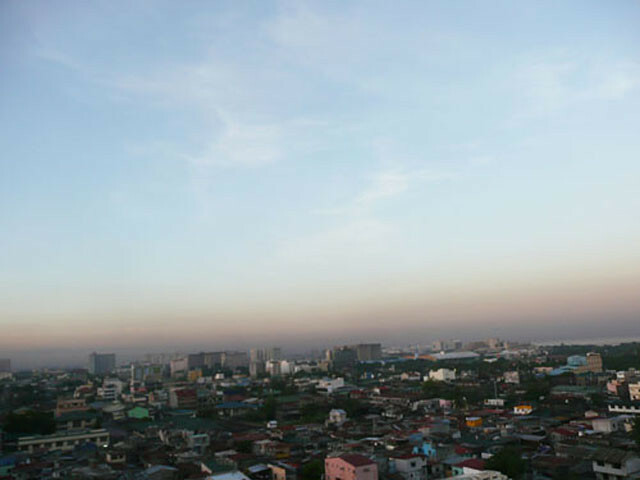 The Manila skyline, a mix of poverty and wealth. Photo by Stefan Christoff. More than half of the Philippines 94 million inhabitants live below the poverty line, millions of whom assemble their homes from the garbage found in their communities. Photo by Stefan Christoff. Two armed men enter a crowded laneway. They make their way past a small concrete building to the sound of screams from women and children. The first brandishes a pistol, extending it towards the crowd with his left arm, and a man who scans the building’s rooftop through the sight of his assault rifle follows him closely. The gunmen, both dressed in blue military garb, double back to the street and out of sight. Seconds later, screams echo through the laneway once more. While shots ring out at a distance, a few civilians barricade themselves inside a classroom and wait for the violence to let up. 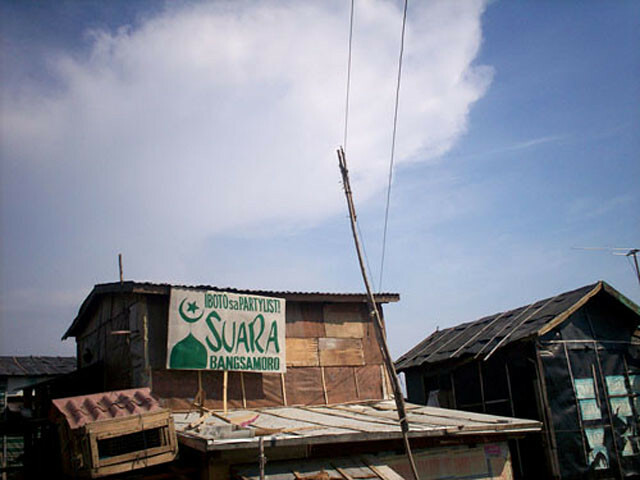 This video footage was captured at a polling center in Lanao del Sur, Philippines during the country’s 2010 elections. It’s a real reminder of the rivalry between political factions vying for municipal seats on local ballots. Since 2001, when Arroyo took office, there have been over 1,000 political killings in the Southeast Asian country. Politically motivated violence was just one of many challenges facing the Filipino people leading up to the polls on May 10. 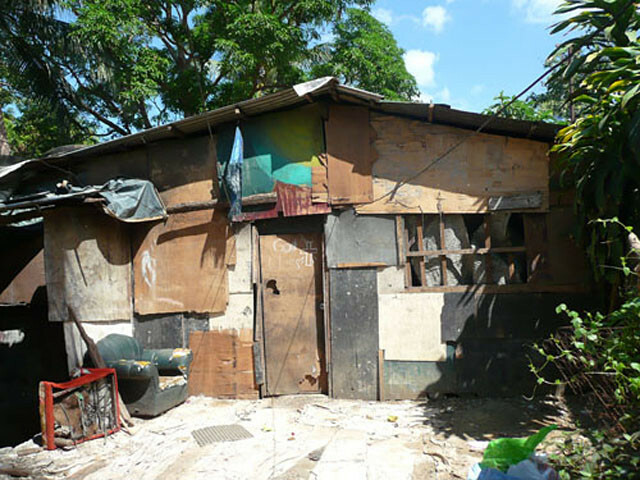 In the past decade, five million people have fallen below the poverty line. The poor now make up over half of the country’s 94 million citizens. While poverty ravages communities across the Philippines, the war between the U.S-backed Arroyo government and the New People’s Army—a communist insurgent group that has been fighting the Filipino government since the late 1960s—continues to claim lives. Stefan Christoff, a Montreal-based activist, was part of the People’s International Observers Mission, a watch group that spent most of May in the Philippines reporting on human rights abuses in an effort to curtail election-related violence. Christoff, who also took part in the PIOM during the Philippines’ 2007 mid-term elections, said that the gunfight in Lanao del Sur illustrates just how casual political violence has become in the Philippines. “If the Armed Forces of the Philippines is carrying out politically motivated assassinations against progressive activists—which according to Amnesty International is a fact—and there is no legal accountability, as few soldiers have ever been brought before a court of law to be held to account for the killings, then violence in a polling centre like in Lanao del Sur becomes normalized,” he wrote in an email to The Link. Since 1997, Canada’s Military Training Assistance Program has provided the Filipino Army with support operations and staff training. The army has not limited killings to progressive activists, added Christoff. Christoff noticed the military at polling stations across the Philippines. Voters were often flanked by armed soldiers, which Christoff said disrupted the democratic process. During his time in the Philippines, Christoff also spoke to Ariel Delgado, a community health worker who said the military had occupied a daycare centre outside of Manila in 2009. Delgado said the army used the daycare to interrogate local activists and discourage people from voting for left-leaning political parties. On Nov. 23, in the Maguindanao province, a gang of over 80 gunmen halted a convoy of opposition gubernatorial candidate Esmael Mangudadatu’s supporters. The gunmen then forced the supporters out of their vehicles and murdered them. Of the 57 victims—which included Mangudadatu’s wife, sisters and 12 journalists—at least five women were raped before being killed while others were tortured and beheaded. Along with members of his father’s private army, the Maguindanao provincial governor’s son was subsequently arrested and charged with the murders. According to Amnesty International, the governor’s troops were just one of 117 private armies that operate within the Philippines. This year, the Philippines became the first Asian country to hold fully-automated elections, outsourcing the management of ballot counting to a multi-national corporation. “The government outsourced the whole administration of the electronic vote to a private corporation,” said Christoff. Smartmatic, the Venezuela-based corporation that administered the vote, have since been criticized for providing minimal technical support along with their voting machines. In some cases, Smartmatic would only employ one technician for a polling station that served over 10,000 voters. “There is a whole tradition of poll watching and civilian observers being at the different precincts as the votes are tallied,” continued Christoff. “That whole [culture of] civilians participating in the count of the vote was usurped by the electronic process. Although he hasn’t officially been proclaimed president by a joint session of congress, Benigno Aquino is projected to win the Filipino presidency by a wide margin. While power changes hands in Manila, the urban poor living on the outskirts of the Filipino capital are still among the world’s most marginalized. Millions of families live without access to healthcare, education or clean drinking water, often subsiding on the scrap metal collected from the mountains of garbage that are dumped in their neighborhoods each year. “The real test will be what he does about the political violence,” said Christoff. “If he admits there have been at least 1,000 murders and takes steps to bring back activists that have been disappeared, it will go a long way towards earning the trust of the people.